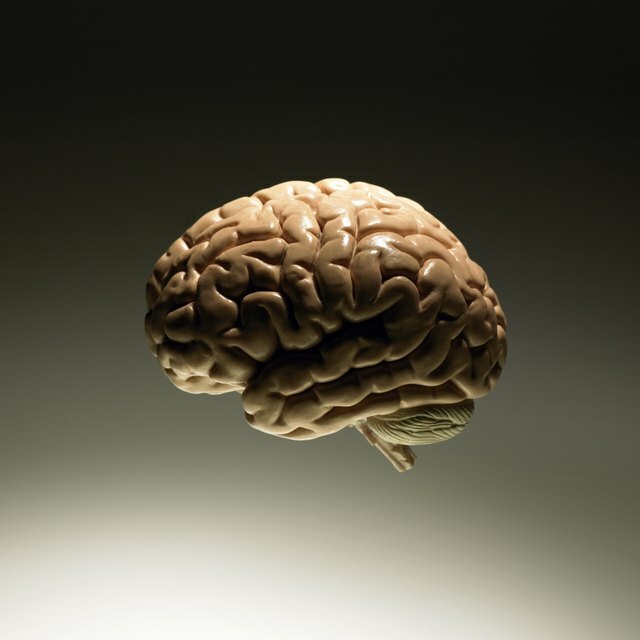 The human brain has approximately 100 billion nerve cells. Nerve cells are also found in the spinal cord. Together, the brain and spinal cord make up the central nervous system (CNS). Each nerve cell is called a neuron, and this is comprised of a cell body directing its activities; dendrites, small, branchlike extensions that receive signals from other neurons to transmit to the cell body; and the axon, a long extension from the cell body along which electrical signals travel. Such signals not only connect the brain and spinal cord, but they also carry impulses to muscles and glands. The electrical signal that travels down an axon is called a nerve impulse. Nerve impulses are electrical signals that travel down an axon. Neurotransmission is the process of transferring these signals from one cell to another. This process stimulates the membrane of a neuron, and that neuron needs to signal another neuron, essentially working in a chain of neurons, in order for the information to travel quickly to the brain. That nerve impulse travels down the axon of the receiving neuron. Once dendrites of the next neuron receive these “messages,” they can transmit them via another nerve impulse to other neurons. The speed at which this occurs varies, depending on whether or not the axon is covered in the insulating substance called myelin. Myelin sheaths are produced by glial cells called Schwann cells in the peripheral nervous system (PNS), and oligodendrocytes in the CNS. These glial cells wrap around the length of the axon, leaving gaps between them, which are called nodes of Ranvier. These myelin sheaths can greatly increase the speed at which nerve impulses can travel. The fastest nerve impulses can travel at approximately 250 miles per hour. Neurons, and in fact all cells, maintain a membrane potential, which is the difference in the electrical field inside and outside the cell membrane. When a membrane is resting, or not being stimulated, it is said to have resting potential. Ions inside the cell, particularly potassium, sodium and chlorine, maintain the electrical balance. Axons depend on the opening and closing of voltage-gated sodium and potassium channels to conduct, transmit and receive electrical signals. In resting potential, there are more potassium (or K+) ions inside the cell than outside, and there are more sodium (Na+) and chlorine (Cl-) ions outside the cell. A stimulated neuron’s cell membrane is altered, or depolarized, allowing Na+ ions to flood into the axon. This positive charge inside the neuron is called action potential. The cycle of an action potential lasts one to two milliseconds. Eventually the charge inside the axon is positive, and then the membrane becomes more permeable to K+ ions again. The membrane becomes repolarized. These series of resting and action potentials transport the electrical nerve impulse along the length of the axon. At the end of the axon, the electrical signal of the nerve impulse must be converted into a chemical signal. These chemical signals are called neurotransmitters. In order for these signals to continue to other neurons, the neurotransmitters must diffuse across the space between the axon to the dendrites of another neuron. This space is called the synapse. The nerve impulse triggers the axon to generate neurotransmitters, which then flow into the synaptic gap. The neurotransmitters diffuse across the gap and then bind to chemical receptors on the dendrites of the next neuron. These neurotransmitters can allow ions to pass in and out of the neuron. The next neuron is either stimulated or inhibited. After neurotransmitters are received, they can either be broken down or reabsorbed. Reabsorption allows for neurotransmitters to be reused. The nerve impulse allows for this process of communication between cells, either to other neurons or to cells in other locations like skeletal and heart muscle. This is how nerve impulses rapidly direct the nervous system to control the body. Science Museum: What Are Nerve Impulses? Dianne, J.. "What Is the Electrical Impulse That Moves Down an Axon?" Sciencing, https://sciencing.com/electrical-impulse-moves-down-axon-6258.html. 26 April 2018.